Nistec has received the certification of the ISO9100 prestigious Quality Standard for manufacturing aviation, space and security products. Aviation, space and security manufacturers (air, sea and land) in Israel and abroad, require the suppliers and the sub-contractors to document the quality system in accordance with the specific requirements of this industry. This is a contractual requirement that suits organizations that manufacture aviation, space and security products, assemblies and PCB’s as well as develop hardware or software, and to organizations that perform integration or maintenance. The AS9100 Standard was prepared by an international entity (SAE Aerospace), under the sponsorship of IAQG – the umbrella organization of the aviation industry, which includes some of the largest companies in the field, such as: Boeing Gulfstream, Lockheed Martin, Honeywell, GE, MTU, Airbus and more. The recognition of the Standards Institution of Israel in the adaptation of a quality management system in the aviation industry (according to the requirements of AS9100) attests that the organization has taken the necessary measures to fulfill and implement its commitment to the quality of its products. The surveyors of the Standards Institution of Israel who carried out the examination during a whole week at the Nistec Production Plant in Petah-Tikva, Israel were impressed by the fact that the Production Plant consistently supplies a product that meets the customer’s requirements as well as other applicable statutory and regulatory requirements. Likewise, the organization strives to increase the customer’s satisfaction by means of an effective implementation of the system, inclusive of processes intended for continuous improvement and an adaptation assurance to the customer’s requirements. 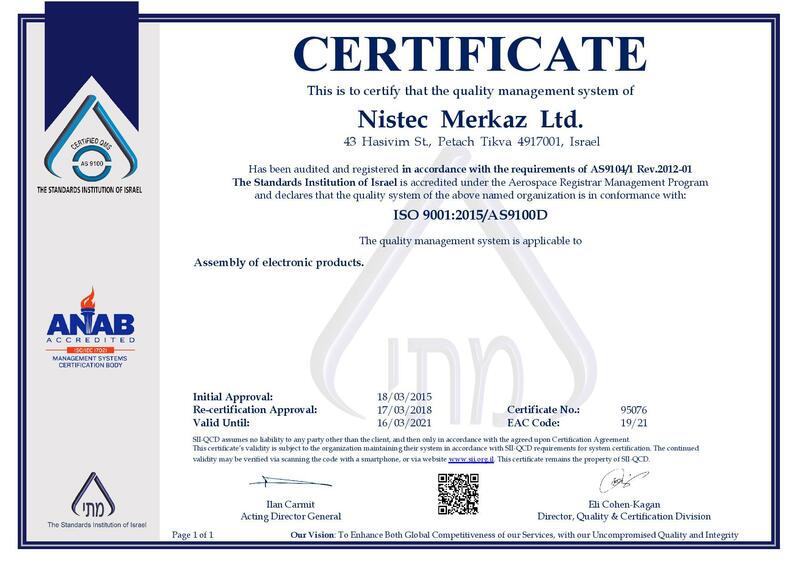 “I am very pleased to receive this prestigious certification”, stated Yitzhak Nissan, CEO of the Company, “This constitutes further evidence that our employees at the production line are fully committed to stringent and meticulous quality processes and to continuous improvement, and for this reason, they have my full appreciation”.